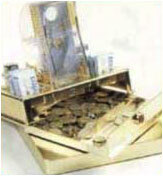 Table Shooter Machine - Body Weight Machine : Central Media Pvt. Ltd. I am called the "Table Shooter" Machine. I am so glad that you are taking a few minutes to look me over. I am without a doubt the most exciting machine you have ever seen! I have been test marketing myself for the past year and I can only tell you that my results are fantastic to say the least! This is the 100% moneymaking machine. Imagine, for just a minute, that you are in a restaurant waiting for your meal and you see me, a cute little game on your table. I am holding THE MENUS, THE SUGAR, THE COFFEE CREAMER, and THE SALT AND PEPPER SHAKERS. My sign says, "MAKE THE SHOT AND WIN" (example: discounts, meals, appetizers, airlines tickets etc.) That's right! For just a quarter you can win! How Many people do you think will try me? Well, let me tell you. When Parents, Children, or Friends go out for Breakfast, Lunch, Dinner, or just a Quick Bite to eat, I can take in two or three dollars in just a few minutes. Now picture yourself as an owner and having 30, 40, 50, or 100 "Table Shooter" machines all making money for you on a daily basis! No Sales Tax on product to pay! Why not take a look at this website and see how easy it is to make your dream of financial freedom come true.